My Instagram photos in the Dolomites have made quite an impression! I’ve never had this much excitement (you can read likes and comments here) over a location! 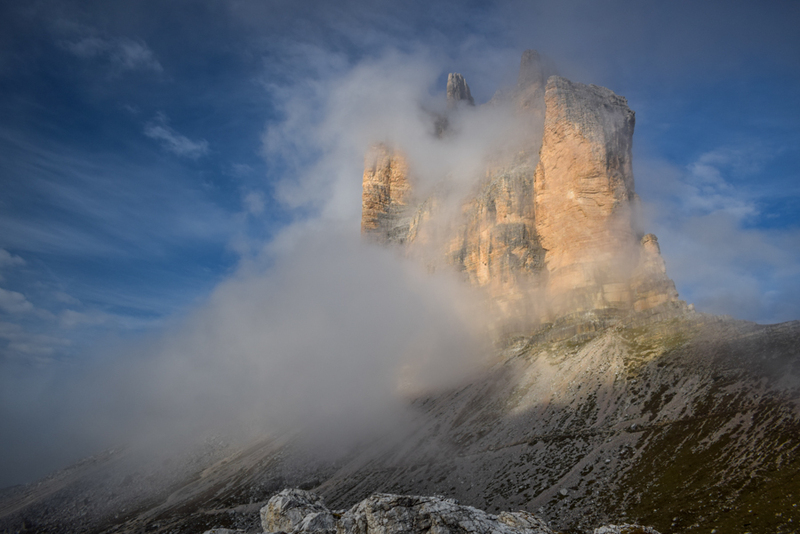 The Dolomites are indeed a photographer’s dream, and a nature lover’s haven. But it seems the destination is not yet promoted at its true value. A lot of you were really surprised at all the beauty there. Of course everyone knows about Lago di Braies (or Pragser Wildsee, its German name), it’s the most photographed lake on Instagram! But it seems many people stop at the lake and don’t explore the entire region. So let me share with you some of my most appreciated posts, where the photos were taken, and a few details about the respective trails or cable cars. 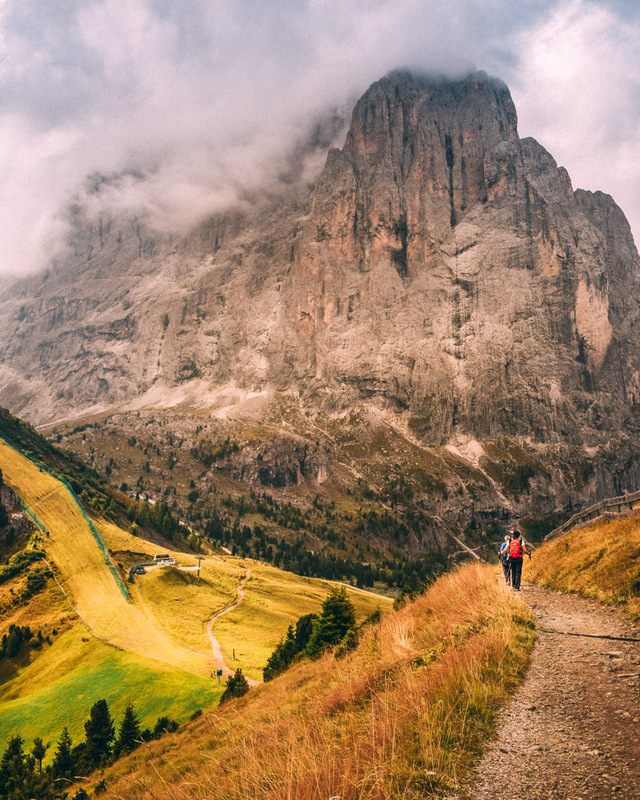 I’ll also share some of the best Instagram accounts to follow for more Dolomites inspiration. But first, some practical tips! 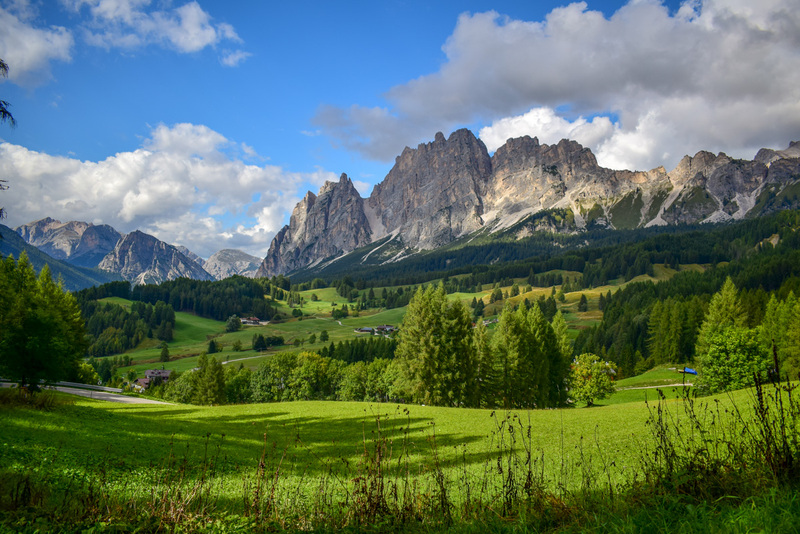 The Dolomites are a mountain range in northeastern Italy and they are part of the Alps. Their name comes from the carbonate rock dolomite that forms them, a beautiful rock that changes color depending on the position of the sun. That’s why you will see some of the most beautiful sunsets here! They are right up North of Verona and Venice, and the closest airports are Milano Bergamo or Verona. But you can also fly out to Venice. 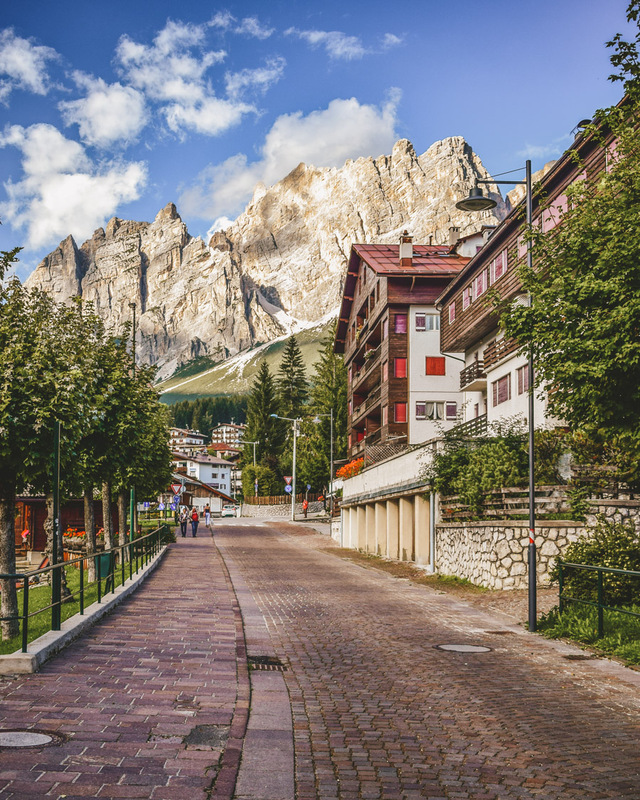 The Dolomites are best explored by car, so you’d better rent one. The region was under Austrian rule until World War I, so you will find a really deep Austrian legacy here, from the street signs, both in Italian and German, to the traditional food, speck and apple strudel. Not Italian at all. It is a popular ski area, but I highly recommend visiting during summer, the scenery is just splendid, everything is so green, and the sun glitters on the surface of the most wonderful lakes in the world! We’ve been in mid-September, and it was already the end season, hotels and restaurants were closing up and it was pretty cold at times. So I think June through the beginning of September is your best choice. I’m not sure of May, but I know that sometimes they have snow in April. 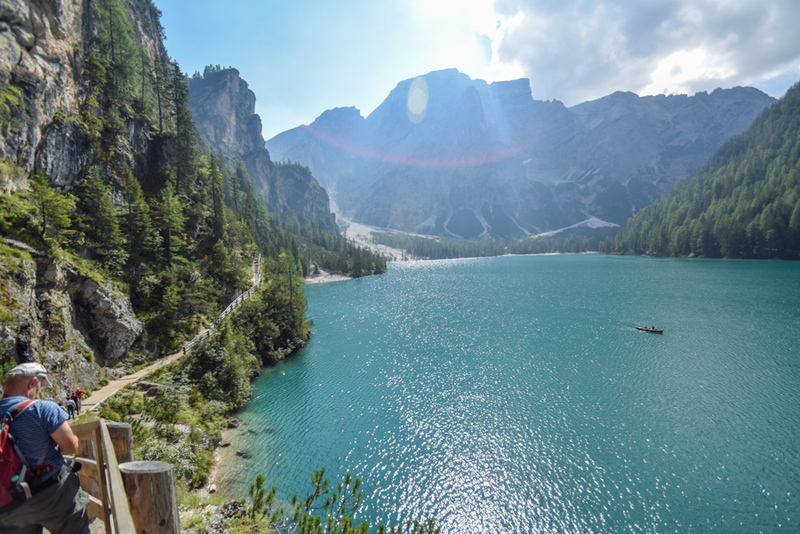 Cortina d’Ampezzo – you can visit from here Lago Misurina, Tre Cime di Lavaredo, the hike to Lago di Sorapis, and also Lago di Braies even though it’s a bit farther away. 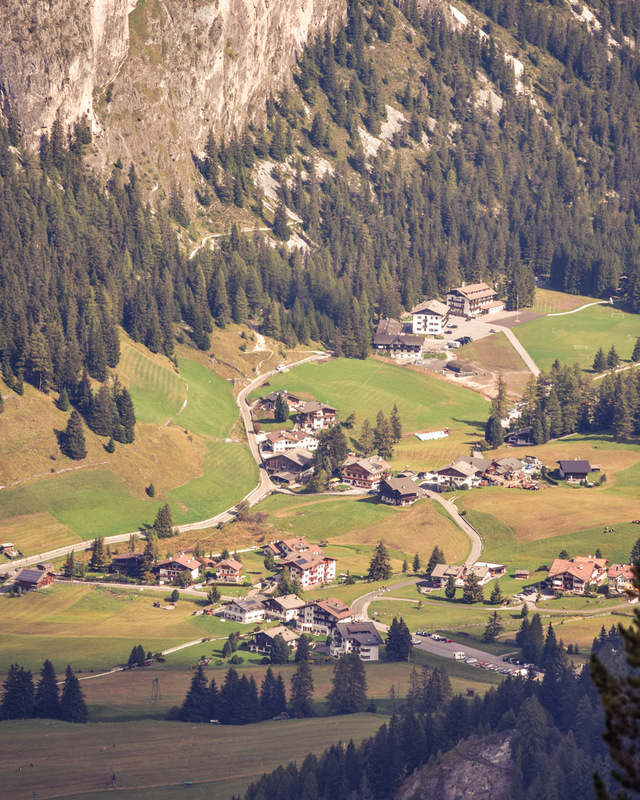 Ortisei – it’s close to Seceda, Ciampinoi, Sella Pass, Pordoi Pass. 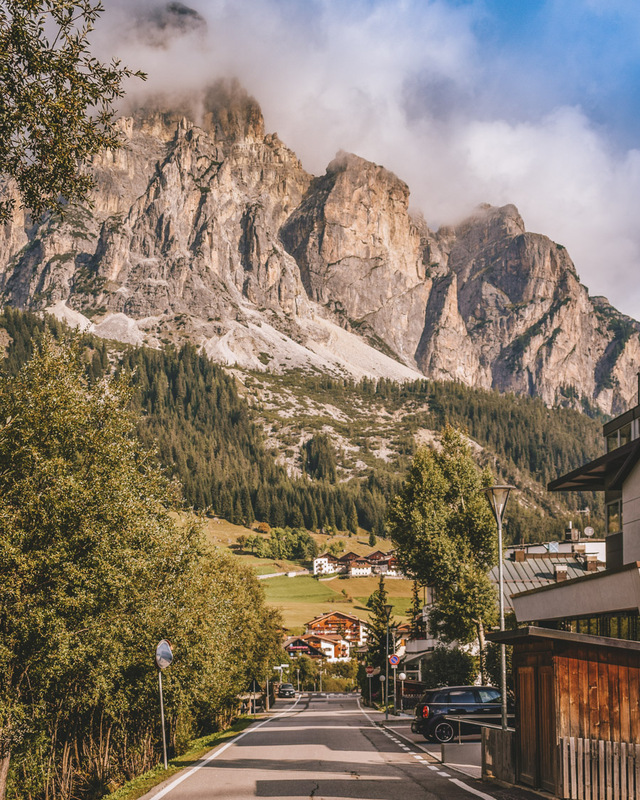 We chose to stay in a single location, in Alta Badia, about 15km North of Corvara. It was not that comfortable driving back and forth every day, but the incredibly beautiful mountain lodge with gorgeous panoramic views where we stayed definitely compensated the driving. We stayed at Ciasa Raut in the small town of Tolpei and it really was everything you could ever dream of a mountain cabin! 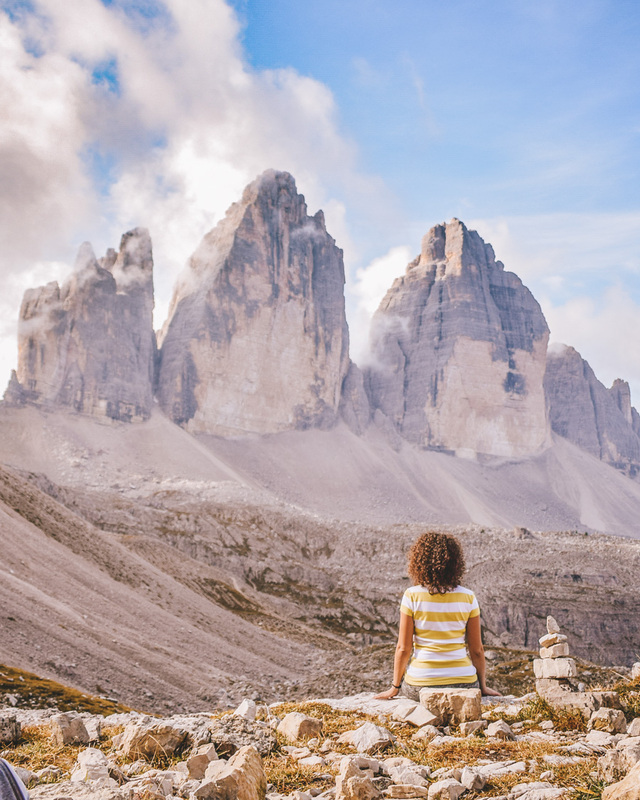 By far my most appreciated post on Instagram until now, we took the following photo on the Tre Cime di Lavaredo loop trail. To take the trail start from Rifugio Auronzo and head onto trail 101 to Rifugio Lavaredo, Forcella di Lavaredo, Rifuggio Locatelli (or Drei Zinnen-Hutte), then take trail 105 to Malga Langalm and then back to Rifugio Auronzo. The photo is taken right before arriving to Forcella di Lavaredo, see the exact google maps location link below. We went on the trail in the early morning, we started at 8 am and the sun was just coming up and glowing on the peak ahead of me. So it was the perfect light for this shot. 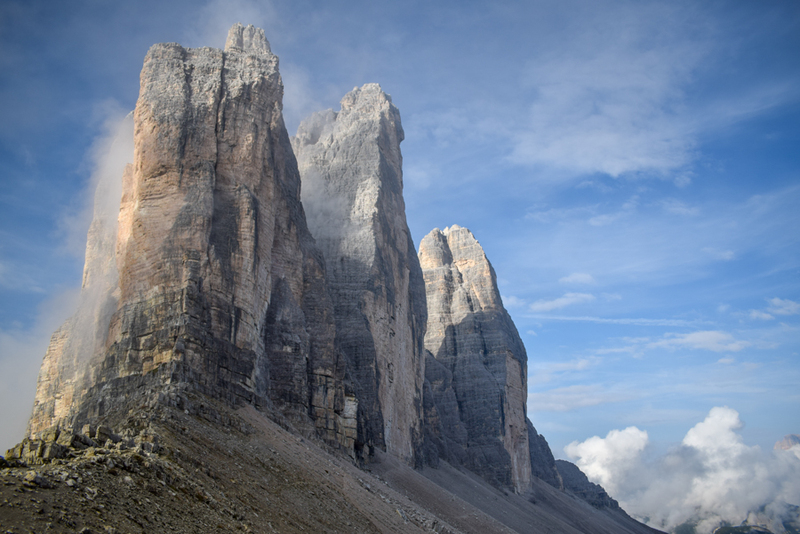 But we constantly had the other side of the Tre Cime (three peaks) in shadow, and I’ve seen some amazing photos of these peaks at sunset. Although I wouldn’t recommend getting caught up in darkness on the trail. So I’m not really sure what is the best time for photos at Tre Cime, I can only tell you we did ours in the morning. 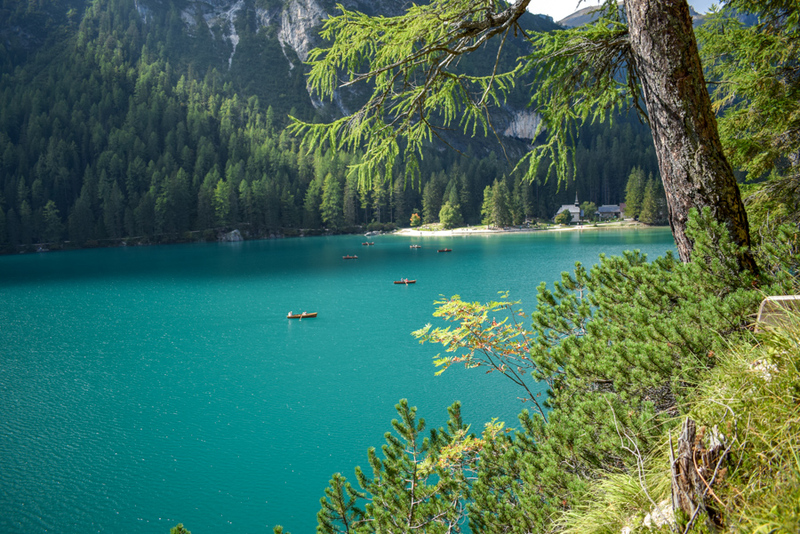 Lago di Braies is for sure the most photographed lake in the world! And it has every reason to be! It’s famous for its splendid reflections and otherworldly colors! You can get here by car, there is a huge parking lot right in front of the lake that costs €6 for the first 3 hours and then €0.80 per half an hour. Tip: You don’t need to stop and take photos only at the famous pontoon, you can actually go around the lake on an easy 3.9km trail that will take you about 1 hour and 15 minutes. I promise you’ll get some amazing views! Also, you can rent a boat at the pontoon for that famous in-the-boat shot. 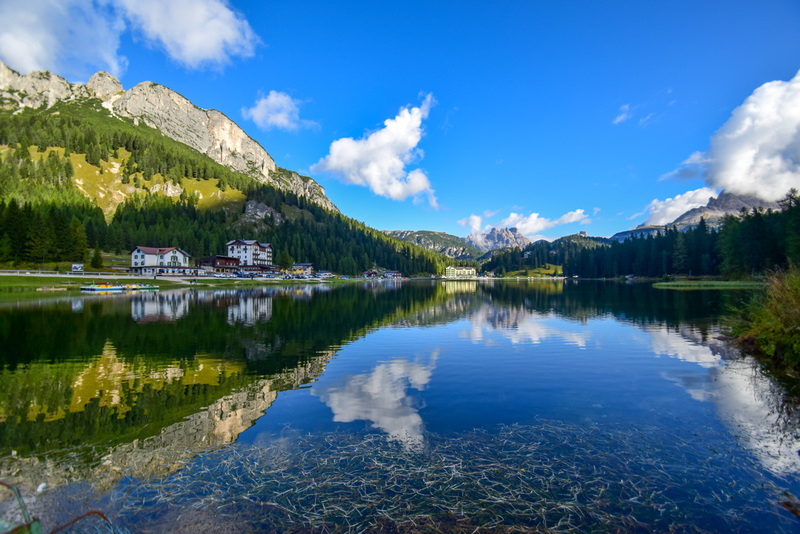 Misurina Lake is very close to Tre Cime di Lavaredo and it’s a lovely little lake with two beautiful hotels on each end. Head on both shores to photograph the two hotels with a dreamy mountain landscape behind. We used a telephoto lens to get this close up shot, you can see the entire beautiful lake in the photo below, taken with a wide lens. Lago di Sorapis is an amazing glaciar lake, one of the most beautiful places I’ve ever seen! It’s not that well known because it’s not that easy to reach, there’s a 2h 5km hike to it, so you have to like mountain trails to get to this view. The lake has amazing turquoise waters and it’s such a great reward after all that effort! 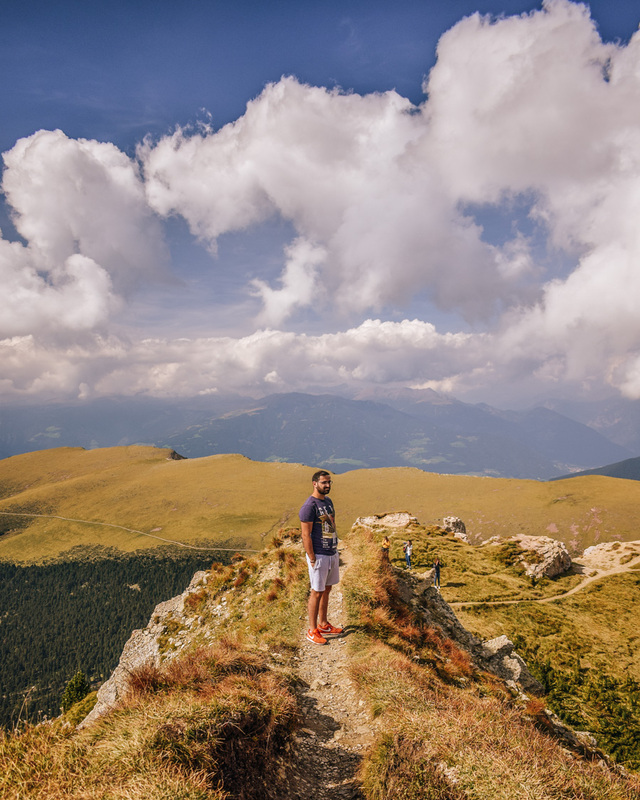 The trail is medium in difficulty and it begins at Passo Tre Croci (google maps link), where you can leave your car for free on the side of the road. We took the 215 trail to Lago di Sorapis, it’s 5.3km one way. We went back to Passo Tre Croci on the same 215, because it’s an easier trail, we spent 2h on the way there and 1.5h on the way back. An alternative way for returning would be trail 216, but it’s more difficult and you should be experienced before heading on it. A lot of the 215 trail to Lago di Sorapis is an easy walk through the woods and only towards the end the trail continues on the side of the mountain. There are a few (very short) steep portions, but they are lined with cables that you can hold on to. So in reality the trail is not very difficult, although it does require some effort. 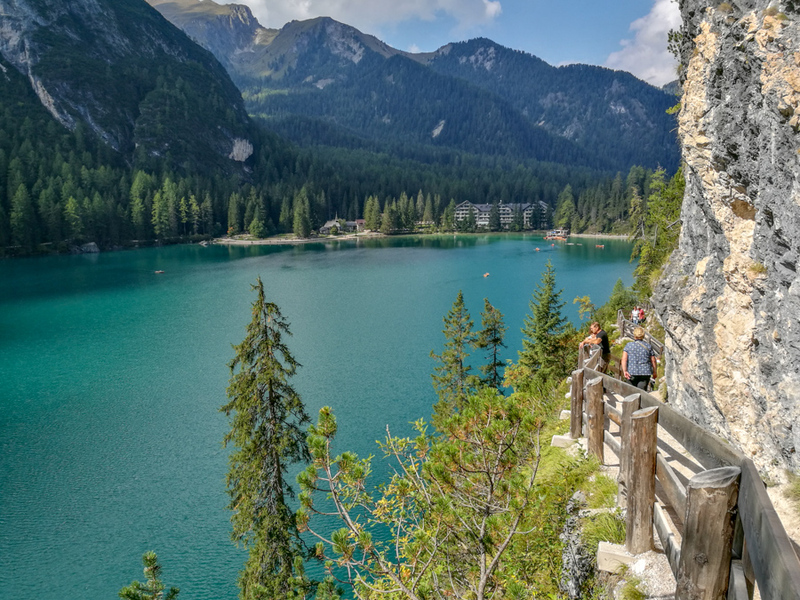 There are so many trails and cable cars in the Dolomites that offer unforgettable views! As we (unfortunately) don’t live there and were on vacation for a limited amount of time, we had to choose. And one of our choices was mount Seceda. You have to take two cable cars to get to the top, at 2500m high. From where the cable car leaves you, you have to climb just a bit higher on foot to get to those amazing views. Another cable car that we chose was on the Ciampinoi mountain. Up there you will find lovely 360 degree views, a restaurant, sun chairs where you can lounge and even some trails if you feel like hiking! We walked just about 100m from the restaurant on one of the trails to get the first shot and used the telephoto lens to get the second one. The cable car for Cima Tofana is an absolute must when you go to the Dolomites! It’s one of the highest peaks at 3200m! Unfortunately we caught some cloudy weather when we went up, so we didn’t get to see much. The clouds were coming and going on one side, but on the other side, towards Cortina d’Ampezzo, they never moved, so we didn’t get to see the gorgeous valley. I would definitely recommend going there in the morning, everybody told us that clouds usually come in the afternoon. 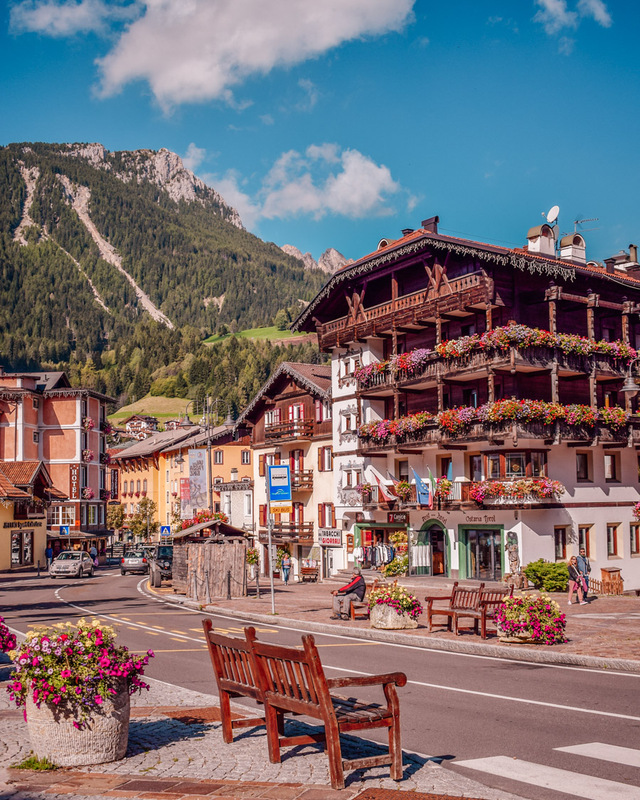 The small mountain towns are all very scenic, and believe me, you will find yourself walking along the streets with a huge smile on your face! How did that get there? Oh yes, everything is so incredibly beautiful around you!! You don’t even have to plan a photo shoot here, it’s just point and shoot, you will definitely capture something amazing. Here are a few of our favorite shots that I plan to post on Instagram! There is an amazingly beautiful little church in a valley surrounded by mountains, that offers the picture-perfect scenery! 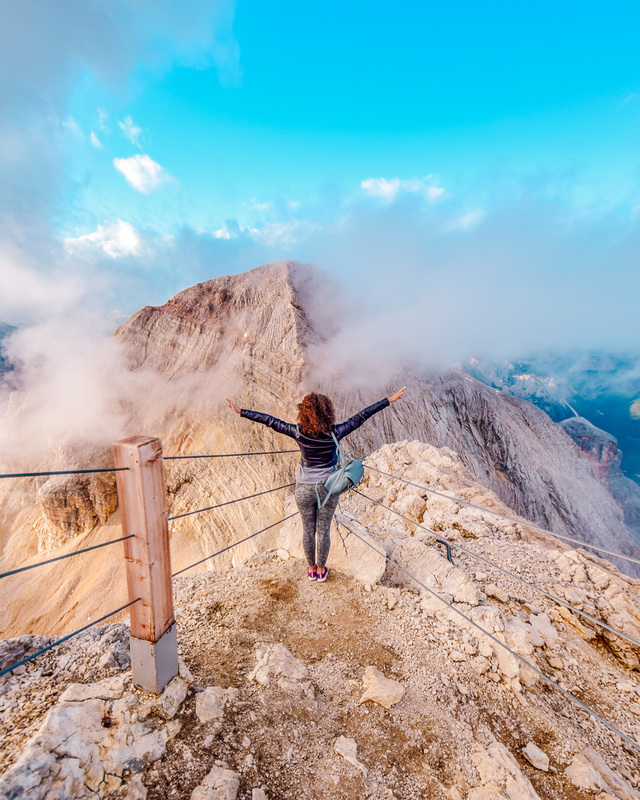 We didn’t get to see it unfortunately, but it’s quite important on the list of best Instagram photo spots in the Dolomites, so I must include it here and show someone else’s photo for it! The church is called Kirche St. Johann in Ranui (Chiesetta di San Giovanni in Ranui) and it’s in the small town of Santa Maddalena. I will give you the location of the church, but I am not sure where is the best place to shoot it from, since I’ve not been there myself. I’ll let your imagination do the work 😊. 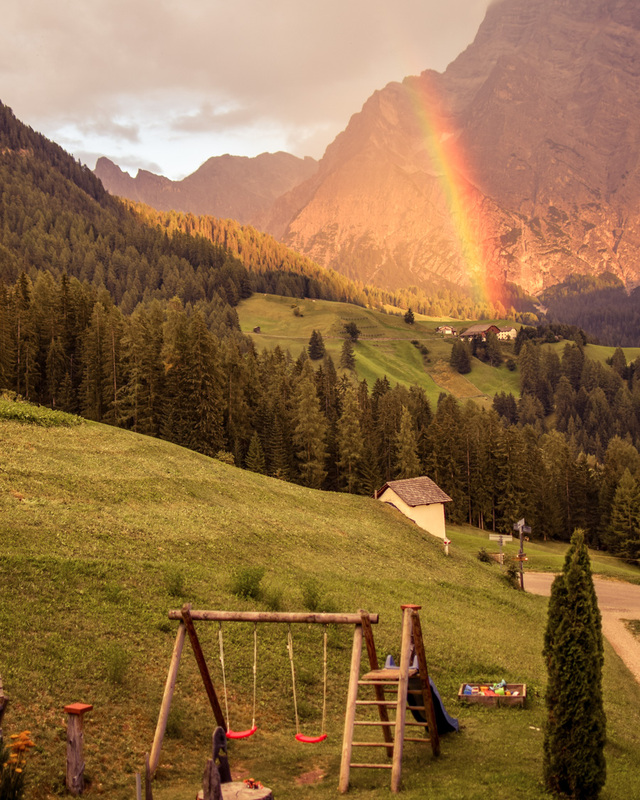 One of the most beautiful sunsets we’ve ever seen was right at the guest house where we stayed during our trip in the Dolomites, Ciasa Raut in Tolpei. I included more details about accommodation options at the beginning of the article. We happened to be here at sunset, on the balcony savoring some delicious Italian bites, when this happened 😍! 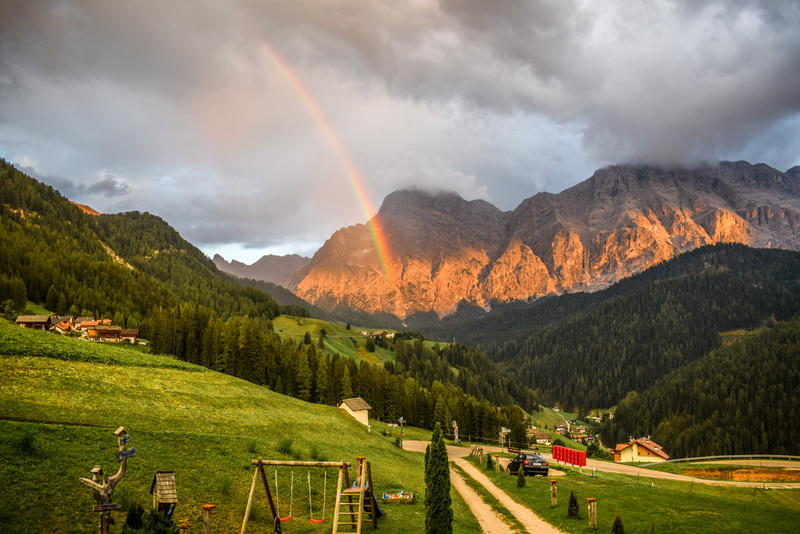 Rainbow sunset at Ciasa Raut, Dolomites! 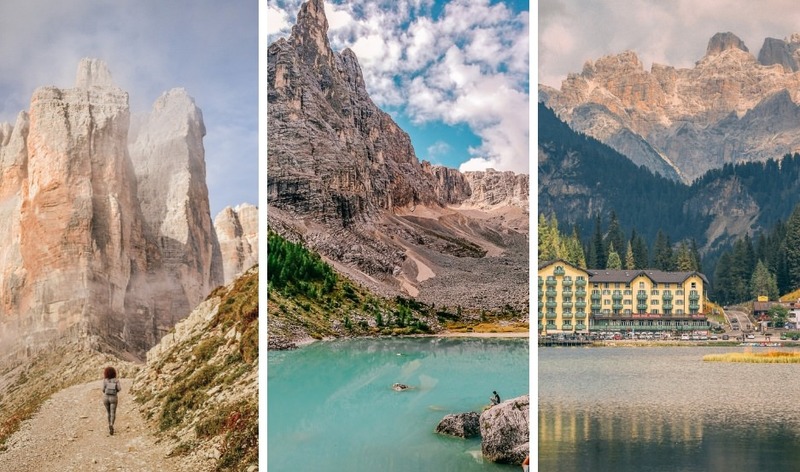 Let me share with you a few feature accounts that share the best photos in the Dolomites. I guarantee they will take your breath away ♥! You will most likely find here all the photo spots I wrote about, and more, so watch out for the descriptions and take notes! Or save them on google maps, as I do, so you can easily find them when needed. 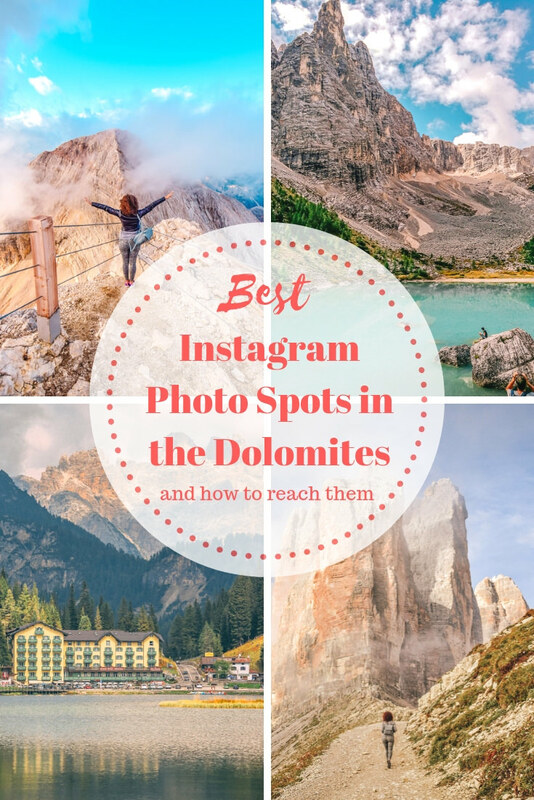 Here are the best Dolomites Instagram feature accounts in my opinion: @insta_dolomiti, @magic_dolomites, @passionedolomiti. I really hope you found my post helpful, and don’t forget to pin it if you loved it 😊. Art Nouveau architecture DIY Tour in Brussels, the city where it all started!